So, I felt the need to take a bit of a departure from my recent horror film reviews and I figured what a better time to review a foreign film on Netflix? I’ve always been an Ingmar Bergman fan (but who isn’t, really?) and The Passion of Anna is the only of his on Netflix streaming (much to my chagrin). The Passion of Anna explores isolation and tragedy on a deeply personal level. The close-ups reflect Bergman’s choice to analyze his tormented characters intimately. Overall the film is rather drab and colorless, making Bergman’s slight use of color saturation (notably red) highly crucial. Not surprisingly, I saw many parallels between this film and Tarkovsky’s The Sacrifice. This is a long review, so I tried to break it up in easy to read sections. The most isolated, though not necessarily detached, character is Andreas Winkelman (Max von Sydow), a recent divorcee who moves to a small island to escape the confines of his previous life. Andreas lives a rather plain existence in a small cottage surrounded by books. When Andreas meets the crippled Anna (Liv Ullman), she asks to use his phone. After eavesdropping on her conversation and searching the handbag she accidentally left on his desk, Andreas begins to form a romantic interest in Anna. After returning Anna’s handbag, Andreas is invited to dinner with Anna and her married housemates, Elis (Erland Josephson) and Eva Vergerus (Bibi Andersson). In an odd twist, Andreas ends up having an affair with Eva before eventually falling in love with Anna. Despite the focal point being between Andreas and Anna, Andreas’ relationship with Eva felt more “real” in the traditional sense. Andreas and Anna’s relationship eventually founders when past demons come to light. Their relationship is paralleled against the needless and brutal killings of the island’s animals. The islanders suspect that a friend of Andreas’, a loner who once resided in a mental hospital, is the culprit. But it’s easy to speculate that this “mad man” is actually Anna. Though this speculation is never confirmed or denied, it is remotely alluded to through her slightly unhinged actions and reactions. There are so many intricate intersections between The Passion of Anna, Kieslowski’s Blue, and Tarkovsky’s The Sacrifice, that it would warrant an excellent analysis, one which deserves much more detail than I will provide here. Anna who lost her child and husband in a terrible accident parallels Julie’s (Blue) plight, who also lost her child and husband in a car accident. Andreas doesn’t seek clarity as explicitly as Alexander in The Sacrifice, but they both eventually find it, only to realize this “clarity” leads to more questions. Andreas’ pacing on the side of the road at the end of The Passion of Anna, parallels the frantic running of Alexander as his house burns down. The milk motif, symbolism of nature, and treatment of large themes through the personal lives of their characters are only a few of the similarities between this trio of masterpieces. My Bergman viewing is seriously lacking, as I’ve only actually seen a handful of his films. While you can see aspects of the deconstruction philosophy in Bergman’s other films, The Passion of Anna is the first I’ve seen that actively deconstructs the plot and characters. It’s quite a jarring experience to see the characters we’ve formed a relationship with, suddenly cease to be their character selves by turning to the camera to expose the onscreen fraud. In between the narrative scenes, the actors explain a la documentary-style what they believe are their characters’ motives, thoughts, and feelings. This deconstruction is an interesting approach to take in filmmaking, and it’s certainly not something that can be easily accomplished without coming off as tacky or overly pretentious. After the first interview with von Sydow, the interviews were much easier to swallow as I found myself expecting them. A less attentive director would certainly fail at throwing such an avant-garde aspect into an otherwise typical narrative film, but Bergman is no hack. These interviews add a depth and intensity that I appreciated more than I expected. Have you seen this one? I would really love some more feedback. 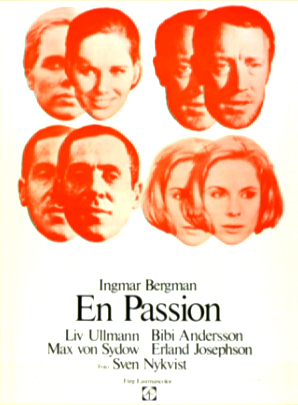 There’s so much to discuss in all of Bergman’s films, but I haven’t seen much discussion on this particular film. i’ve only seen the magician, virgin spring, and persona but this is on my list. great analysis! Thanks, Zach. It’s a good one. As I mentioned, my Bergman viewership is lacking as well. Not sure why as I’ve thoroughly enjoyed all the ones I’ve seen so far. I think his greatest film is The Seventh Seal, and I think it’s the greatest Swedish film ever made, and it’s one of the greatest films ever made. Run, don’t walk to see this one. And thanks for the Passion of Anna analysis. I’ll watch it right away. ’ve started to-re-Bergman too. Why not run through some of the YuTus. There are quite a lot – even if the quality is not always brilliant. Persona [digitally remastered Criterion] is good definition. Good on a big screen tv. But get it while you can. They can suddenly be taken down. Looking forward to see what you think of others. I’m watching them in a rather random fashion. Felt Persona was the place to start for some unexplained reason (as I watch more, the order I might have watched them, and if there was a point to so, will become apparent, no doubt), and at the same time doing a lot of reading. The marks of the authorship aspect interests me particularly, but any background reading, which I find too tempting not to do [his concerns with music for example] can side-track, and in the case of reviews and analysis, overload and confuse, but a certain basic knowledge can help I’m finding, to get most from the films. Obviously too much background can at the same time reduce the pleasure of simply watching the films, learning some of the life, and understanding in your own way. It’s all too easy to become reliant on received opinion of the bien pensants – which is of monumental proportions even on the web, let alone all the books. I’m finding there seems to be a logical way to build up a study through trial and error. I have watched some of the interviews he gave which don’t give too much away about the plots of the films themselves, but help build up interest in the director and his filmic ambitions and vision. On reflection – and this seems good for a short post or two – this Bergman thing is beginning seem a bit like, Hi, My name is John, I’m a Bergmanophile. Hello, John. Thank you John, welcome. P.S. Mentioning Kieslowski (a favourite of mine..) reminds me he said he admired Bergman’s work (though what director doesn’t…particularly auteurs), which makes me want to re-watch some Kieslowski. Too many films, too little time. Your Anna remarks (I’ll perhaps watch this next..) made me look up the filmography. 1969. Right at the height of deconstructionism.